Earlier in this year Turkish Armed Forces (TAF) and Turkey backed part of Free Syrian Army (FSA) started operation ‘Olive Branch’ (Zayten Dali Harrkati) in order to eliminate the control of Kurdish militant organization People’s Protection Unit (YPG) in Syria’s Afrin area. The intervention of Turkey started after the declaration of the US that it would form a border security force from the Kurdish led groups in the northern part of Syria. After elimination of Daesh terrorists from this region, the YPG took control over the most part of Afrin. When this can be considered as political and military threats for all parties of Syria in some extent, Turkey claimed to be threatened the most if this would have happened. So, when many opposed Turkey’s operation in northern Syria arguing that it violates Syria’s sovereignty and international law, Turkey defended its action mentioning the article 51 of the United Nation’s charter which gives Turkey the right to self defense as Turkey claimed that she has been attacked more than 700 times by the YPG militants. Turkey believes that the YPG has core relation with another Kurdish organization that operates its actions inside the country, named PKK. However, YPG has refused such accusation of Turkey and claimed that Turkey has falsely accused them just to justify the operation. But YPG’s claim becomes invalid if their joint actions are taken into account when Kurdish leader Mr. Barzani called out for a referendum to establish a Kurdish state. 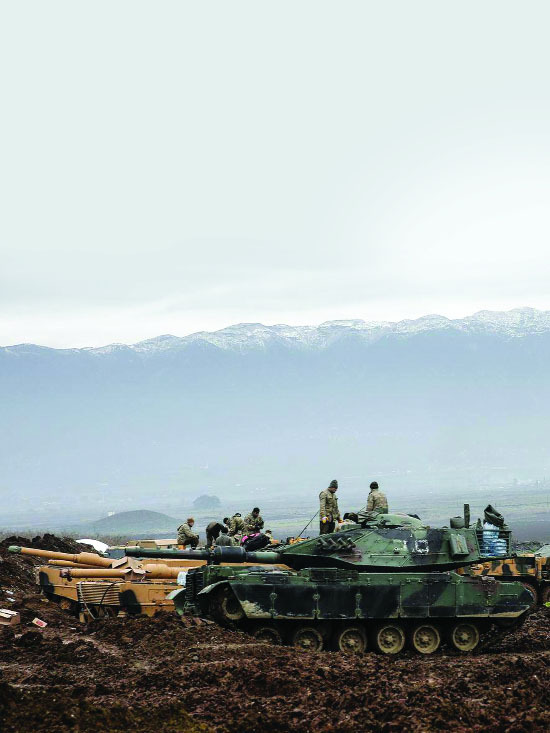 When it came about civilian’s safety, Turkish Armed Forces claimed that the operation would have been finished much earlier if they indiscriminate between civilians and terrorists. But despite this, 395 to 500 civilians were killed which Turkish Armed Forces claimed to be inevitable. On 18 March, Turkish president Mr. Recep Taiyep Erdogan officially confirmed that Turkey has gained victory in Afrin. But with this declaration of Mr. Erdogan, the question comes to the front that has the tension really been vaporized which shadowed the whole region for more than seven years? As the United States declared to form a border security force recruiting its members from the Kurdish forces, this operation will make the relation between Turkey and the USA bitter. Though both countries are member of NATO and past relation between these two countries was good. This new situation will give Russia a chance to make a stronger diplomatic relation with Turkey and thus it probably is going to have a stronger grip in Middle Eastern politics than before. Kurdish sources claimed that this operation wouldn’t take place if Russia wouldn’t have allowed Turkey to do so. Russian declaration to withdraw its personnel from the area on the starting day of the operation can be considered as a confirmation of this. Beside, Moscow ended its responsibility giving only a statement about this issue, which is considered to be a green signal to Ankara. If these are taken into consideration, then Kurdish claim can’t be denied. Before this, probably Turkey had come to an agreement that Mr. Bashar al Assad won’t make hay while the sun shines in Idlib. But there must have been some easy going conditions from Turkey to ensure both parties’ satisfaction. As on the first day of operation Damascus confirmed that it has gained control over the Abu duhr airport that was previously controlled by Turkey backed FSA. All these can’t be coincidence. Russia had never a strong diplomatic relation with Kurds. All it did in past to play Kurd cards to tackle Turkey. When the SDF and other Kurdish forces decided to hand over their yoke to the USA, Russia found it more beneficial to have alliance with Ankara. This new alliance seemed to have great importance to Russian president Mr. Vladimir Putin. There are some reasons to take this into consideration. One reason may be to prove e him as a peace loving and victorious president in front of his people so that it influences them in Russian president election. The first step was making Idlib a conflict free zone. Russia was informed that a new conflict in Idlib would cost so much their allies. It would have brought more humanitarian catastrophe like Aleppo and that would compel Russia to be back in the front. Besides Turkey convened Congress of Syrian People which held on 29 January in Sochi was another step towards Mr. Putin’s goal that was meant to bring a peaceful end of Syrian problem. Thus creation of alliance with Turkey in Afrin issue let Russia solve the Idlib problem in a diplomatic way that brings fruits for Moscow, Ankara and Damascus. Apart this political grappling, alliance between Russia and Turkey has opened a new economic door. The long expected Russian project “Gas Line through Turkey” is probably going to take place this time. Turkey cancelled Russian proposal on this project in 2015. But this time the CEO of Gasprom Mr. Alexi Miller confirmed that an agreement has been signed ensuring the gas line project from Qatar through Turkey which will bring Qatar, Turkey and Russia’s economic interests are closer. When the Gulf States, which have strong diplomatic friendly relation with the USA, like Saudi Arabia, United Arab Emirates, Bahrain and Egypt, imposed land, sea and air occlusion on Qatar, Turkey and Iran supported Qatar and made it a great market for their products which in turn also conquered hearts of Qatar’s people. Russian project to bring gas from Qatar to Europe through Turkey will make a stronger common economic interest among the mentioned countries. Gaining victory in diplomatic, military and economic fields, Mr. Putin is proved to be succeeded in front of electorates as it strengthens him both in his country and in the international political chess board. While the USA has been failed to ensure safety to its allies, Russia has found a stronger ally in the region. Moreover, Turkey’s statement about upcoming Manbiz operation, which will be followed by Afrin operation, will lessen the probability of making an independent Kurdish state. A referendum among Kurdish people that took place last year, raised a possibility of such a state where Iraq, Syria and Turkey’s Kurdish majority areas will be included to form a Kurdish state. But facing Turkey, Syria, Iran and Iraq’s disapproval and threat of military action, this Kurdish state couldn’t take place. While the USA supports establishment of such a state and Kurdish military groups in Syria, will it be able to maintain the previous relationship with Ankara anymore? It seems that though the USA and Turkey are allied through NATO, such bitter relationship between two countries will lead to a new axis of alliance. As the world is still considered to be in bipolarization, this new sort of alliance can bring Turkey, Syria, Iran and Qatar closer with support of Russia which may open a new horizon of political change in the Middle East. The writer is a postgraduate student of the University of Dhaka.